Why should the chicken get all the fun? 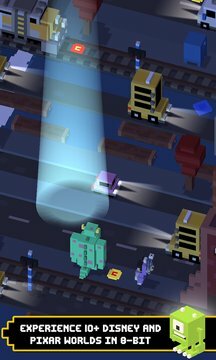 From Hipster Whale, the makers of the original Crossy Road® with over 120,000,000 downloads, and Disney comes Disney Crossy Road—an all-new take on the 8-bit endless adventure to cross the road without splatting! 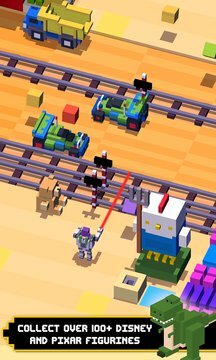 Tap and swipe your way to a record-setting number of steps with 100+ Disney and Pixar figurines while dodging crazy and unexpected obstacles in the 8-bit worlds of Toy Story, Zootopia, The Lion King, The Haunted Mansion, Tangled, Wreck-It Ralph, and more. • COLLECT over 100+ Disney and Pixar figurines, including Mickey, Donald, Buzz Lightyear, Rapunzel, Mufasa, Sadness, Wreck-It Ralph, Madame Leota, and other favorites (many with fun surprises)! • MASTER special themed challenges unique to each of the worlds, such as weathering blizzards, collecting cherries to earn special power-ups, avoiding thundering stampedes of wildebeest, staying clear of falling barrels, and then some!